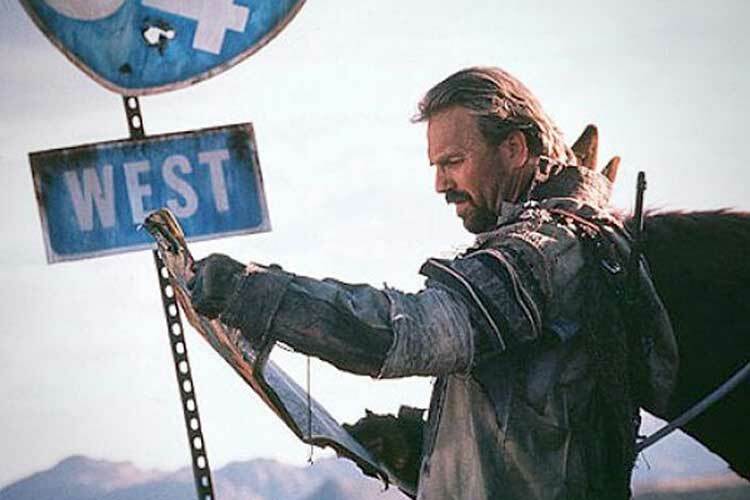 The post-apocalyptic setting is the perfect stage for megalomania, and Kevin Costner’s ego reached its peak with The Postman in 1997. It’s amazing that I managed to survive for 14 years without seeing this ridiculous tale of hope and the power of our postal workers. In his excellent My Year of Flops series, the AV Club’s Nathan Rabin labeled this ambitious movie as a “Secret Success”. In the post-apocalyptic world of 2013 (two years away! ), an unnamed loner (Kevin Costner) travels the western countryside with his mule Bill and earns food through bad performances of Shakespeare scenes. After being captured by the minions of the vicious General Bethlehem (Will Patton), he barely escapes and stumbles upon a bag of mail. Taking on the moniker of The Postman, he claims the U.S. Government has been reinstated, which ferments a rebellion. This leads to all-out war between the rebel mail carriers and the brutal tyrant’s forces. The fate of the entire U.S. civilization may hang in the balance. 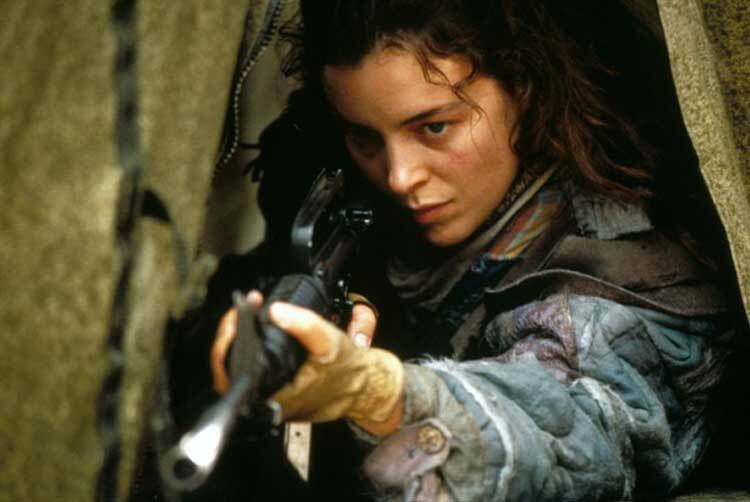 Unlike other post-disaster movies like The Book of Eli, this story’s calamity was a plague, so much of the attractive countryside remains. This environment doesn’t feel much different than our current world, though the cities have been replaced by small towns. We’ve been transported back to the days of the Old West. Horses are the primary means of transportation, and there are few remnants of the industrial age beyond large structures like the Boundary Dam. This is believable if you share Costner’s vision of the ideal world of the western hero. On the villains’ side, Bethlehem runs his army like an old-school dictator, but his forces are pumped up by watching The Sound of Music on the big screen. They loudly reject a screening of Universal Soldier, which is definitely not believable. No violent roughnecks can resist the allure of Van Damme and Lundgren. It’s a close call for this group, but I think this wouldn’t be such a bad world. The Postman is a reluctant hero and doesn’t plan to become a messianic figure, so I can give him that part of it. On his first night in the town, the Postman is propositioned by the attractive young Abby to help give her a child. Her husband’s not able to perform this task, but she seems more interested in the Postman when their tryst occurs. In screenplay 101, it’s unlikely the husband will survive much longer. Few women can resist the urge of the USPS uniform. The other characters include Larenz Tate’s young idealist Ford Lincoln Mercury (not his real name), who is passionate but a bit much. Also, the townspeople play fairly awful music during the dance celebrations that apparently happen every night, so that would take some work. Finally, I must mention the surprising arrival of Tom Petty as an aw-shucks version of himself. Apparently, the rock star is destined to become the mayor of a town built near the Boundary Dam once the plague arrives. I can get behind a guy who’s trying to bring hope to a depressing world, but I’m not sure his quest is compelling. First of all, Costner and Writer Eric Roth (Forest Gump) pile up the sentimentality to almost ridiculous heights. When Abby tells the Postman “you give out hope like it was candy in your pocket”, you know we’ve entered cornball territory. The weird thing about this line is that we’ve rarely seen the Postman doing anything inspiring beyond giving out the mail. He seems ready to give up completely after being shot and stranded in a cabin with Abby for the winter. It takes her forceful push, which ridiculously involves burning their cabin, to get him moving. Honestly, if you take Bethlehem and his disorganized army out of the picture, life doesn’t seem too bad for the townsfolk. There are so many over-the-top scenes in The Postman that I could write a long article just describing them. Grand, sweeping shots of the outdoor landscape go on forever and become tedious after the first few appearances. These moments can’t hold a candle to one of the great silly scenes I’ve seen in a long time. A young boy realizes the Postman’s on the way and runs to grab his letter, but he’s too late. But all is not lost. The Postman spins around on his horse and performs a dazzling move of galloping at high speed and snatching the letter from the kid’s outstretched hand. If this wasn’t enough, Costner shoots this sequence in slow motion with bombastic music underscoring the positive message. That boy will actually return as an adult near the end to remember this greatest moment in American history. 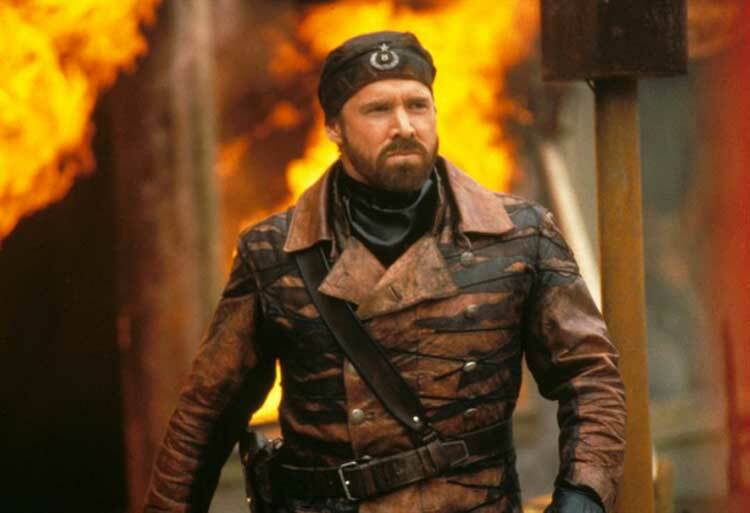 I should also mention the scenery-chewing of Will Patton, who’s generally a competent actor. He performs plenty of evil acts, but he’s at his best when spouting out nasty lines like “You want a war! I’ll give you a war!” When we reach the final battle of the Postman versus Bethlehem, it plays more like a schoolyard fight than a major conflict. The Postman is one the most heavy-handed movies that I’ve ever seen. However, it’s also fairly entertaining because Costner is shooting for the moon. An ambitious failure is almost always more interesting than a safe, mediocre production. That said, this film is a two-hour movie in a three-hour package. There are so many unnecessary scenes that this feels more like an early draft than a theatrical product. Thematically, Costner and Roth clearly are telling us that the survival of this Earth is dependent on the U.S. system of government. One character mentions Europe briefly, but it seems the rest of the world means little when compared to American greatness. The American flag is used several times as the symbol for the heroes when battling tyranny. Bethlehem could represent any evil dictator who would dare threaten our way of life. In fact, I’m surprised conservatives didn’t flock to this movie for its idealistic view of this country’s past. Following Rabin’s rating system of Secret Successes, Failures, and Fiascos, I’d rate The Postman as a mere Failure. Despite its three-hour running time, it still provides an entertaining ride. There are plenty of outlandish moments that don’t work, especially as the sentimentality takes over near the end. Yet I find myself smiling when I think of the thought processes likely involved in Costner’s head when creating this movie. It takes quite a massive ego to cast yourself in the Jesus role as the hesitant savior of all mankind. Did he think audiences would actually flock to it, especially after seeing variations on this format in Dances with Wolves and Waterworld? That answer shall remain a mystery. The Postman was an ambitious movie, it's just too bad that it didn't quite worked out. Nonetheless, you are right that it's much more commendable for a film to set its sight high than to be satisfied with being merely average or mediocre. Thanks Castor! The Postman is pretty much a disaster, but it's definitely not a by-the-numbers action picture. Costner just couldn't help himself and it went way over the top and off the rails. I only had the chance to watch the first half of The Postman before the DVD crashed, but I had read the book by David Brin. The deal with hope, in the book, is that the uniform was significant. It was the idea that there was someone in charge again. The Postman was this part nostalgia, part idea of security, right when people thought that nothing would be the same or secure again. Perhaps the movie didn't explain it as well as the book. Steve, I wonder if conveying the hope of the uniform is easier in the book format. It's trickier in the movie to show this without it being hokey, especially given Costner's reputation at the time. They use some really straightforward dialogue to explain it in the movie, and it becomes pretty laughable. this is an interesting approach to a review, I like the style. And you raise some good points. I had a similar experience as Steve with the DVD but never asked Netflix for a replacement. I'll have to add this back in to my queue. Are you planning on seeing (or have you seen) Stake Land for your post-apocalypse movies? It made the LAMB rounds maybe two weeks ago and sounds like fun, although I don't live close enough to a big population center to see it. Alan, I don't think Stake Land is coming to St. Louis, at least not in the near future. I'll stay on the lookout for it going forward, though. I see that it's appeared in a few festivals, so it's always possible it will be part of the St. Louis International Film Festival in the fall. It also looks like Netflix will have it next month too. Thanks!